Thinkful: The world 50 best restaurants, where is Asia? 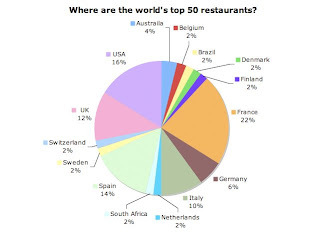 Published by Restaurant magazine, The San Pellegrino World's 50 Best Restaurants is recognized around the world as the most credible indicator of the best places to eat on Earth. In 2008, Spanish El Bulli is number one again, The UK's Fat Duck back to number 2, French Pierre Gagnaire is number 3. I mapped the top 50 per countries only to find out that there are no restaurants listed in Asia. I can't believe that there are no kitchen in Hong Kong, Shanghai or Tokyo that serve better food than in Hakkasan or Nobu (just to mention 2 "asian fusion" restaurants listed in the UK).